Set the table for a magical candlelit dinner in the princess's castle. 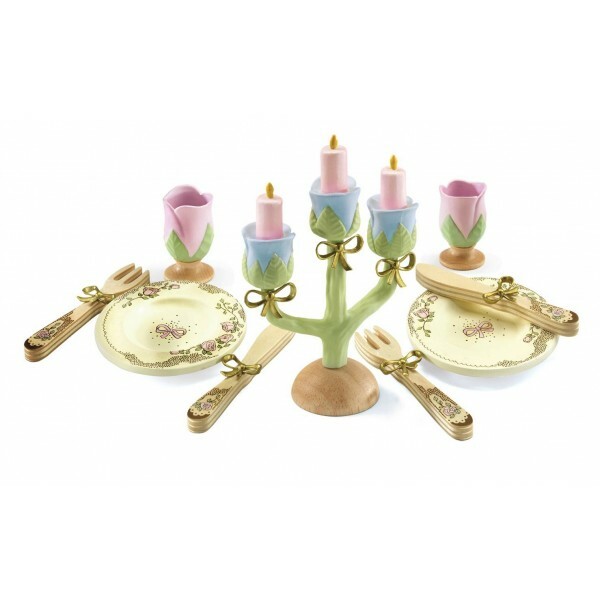 This beautiful set includes cutlery, plates, cups and a stunning candelabra, all set up on a spellbinding place mat that will whisk you into a fairy tale. Use this set to have a magical feast with whoever you invite - your toys, imaginary friends or maybe even your school friends. This set can be used over and over so why not invite everyone! A beautiful way to encourage imaginative thinking and role play. The fine detail used to decorate, makes for a gorgeous set. Perfect for any little princess who enjoys dining with her dollies. This set makes a stunning duo when combined with the Djeco Princess cake set! The elegant designs go together wonderfully.